For a trusted, dependable name in Pemberton commercial electrical contractors, contact the team at D.P. Murt Co. Inc. D.P. Murt is located just minutes away in Pennsauken, and our veteran-owned company has been serving the needs of South Jersey commercial businesses for over 30 years. For every commercial electrical need, from wiring upgrades to new generators to improved lighting, we’re ready to get the job done for your company. We’ll help get your project done on time and on budget. D.P. Murt can work with whatever type of commercial business you own or operate. We’ve provided repairs and upgrades for retail outfits, restaurants, educational facilities and more. 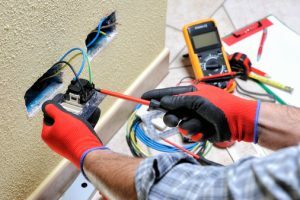 Our technicians are highly trained in installing and repairing electrical equipment, from switchboards and circuits to HVAC and fire alarm systems. If your business is relocating to the Pemberton area, we’ll help design and build a complete electrical system to keep your business running and save you on energy expenses. For more about our commercial services and what we provide, including emergency service, click here. If you’re looking to improve your efficiency and reduce your carbon footprint, contact us about our green and energy saving technology. We install solar technology and energy saving lighting, helping you save on energy costs and reduce emissions. Or if you’d like to learn about how you can reduce your current energy consumption, contact us for an energy conservation audit. We’ll show you how your equipment or unnecessary usage could be driving your costs higher than necessary. When you’re looking to improve the power to your business, contact the expert Pemberton commercial electrical contractors at D.P. Murt today for a free electrical survey. We’d love to show you more about what distinguishes our electrical services in Burlington County. At D.P. Murt, we handle the power, so you can handle the business.